Making gunplay better for the massive FPS series. To change the behavior of a gun in a series as established as Call of Duty is to invite sacrilegious outcry. Luckily, the weaponry you’ll use in Call of Duty: Black Ops 4 reliably follows expectations—sniper rifles for long-range taps, assault rifles as all-around workhorses, SMGs for run-and-gun blitzes, and so on—but developer Treyarch hasn’t completely passed on a personal touch to the staple speedy gunplay we’ve been familiar with for years. 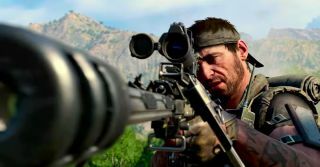 FPS fundamentals of practiced aim and a steady hand will still guide a victory in Black Ops 4, and you’ll also experience a few critical improvements smoothing out combat. The first and perhaps biggest change is a major reduction in flinch effects when taking hits as you’re aiming down a weapon’s sights. Previously, your view would jump and jitter when taking damage, a visual simulation of a bullet’s forceful impact slamming into body armor. Now, you’ll still see clear visual cues as you near closer to death (your periphery will tinge and darken), but you’ll benefit from a steadier viewpoint. The result? Going for headshots is rightfully priority one once more, as you’ll be able to respond with more effective return fire sans any worry of a sudden jerk to your crosshairs. Survivability subsequently hinges upon intelligent movement and outsmarting your opponent rather than straight reflexes, especially if you take a moment to aim down your sights before rounding a corner or braving an exposed area. Further emphasising this skill-centric system is the adoption of set recoil patterns. Essentially, each gun will behave the same way every time you fire it in terms of the spray pattern of the bullets in each magazine or the directional kick if you fire full auto or in long bursts. The identity and characteristics of each gun are further deepened by understanding and mastering the recoil of your preferred firearm; with enough practice, you’ll be able to fully counter a gun’s recoil to pull off tightly accurate shots and compensate with steady mouse pulls to keep your sights square on target. Couple predictive recoil with the reduced flinch mentioned above, and you’ve got a deadly combo rewarding seasoned snipers and beginners alike. Thanks in large part to the scale of the Blackout mode’s immense map, some weapon types will also tout a defined ballistics system governing bullet speed. Rather than fully stick with the traditional hitscan system for its planned arsenal, Treyarch is adopting a mixture of hitscan and ballistics that accounts for the weapon being used and at what range it’s fired at. For example, an SMG would function as a standard hitscan gun at its optimal close to medium range, registering instant hits while your crosshair sits on the enemy player model. Further out, the SMG’s bullets would transition to the ballistic system, calculating each bullet as a physical projectile affected by gravity and elevation. You’ll notice similar setups in other weapon types—no more shotgun snipes from across a hallway—but you’ll best experience it firsthand in the new Blackout mode, where all weapons will use the ballistics model. Ultimately, Call of Duty: Black Ops 4 demands the constant improvement of individual skill above anything else—after all, that’s what you’ll need to pull off that final miles-long snipe to be the last man standing.